Endemic to the Mamberamo river system, New Guinea, Indonesia. This is one of the largest river systems on the island, being over 2000 km long. Tends to inhabit swiftly flowing tributaries off the main river, as well as surrounding swamps and marshes. The fish congregate around areas of aquatic vegetation, or submerged roots and logs. 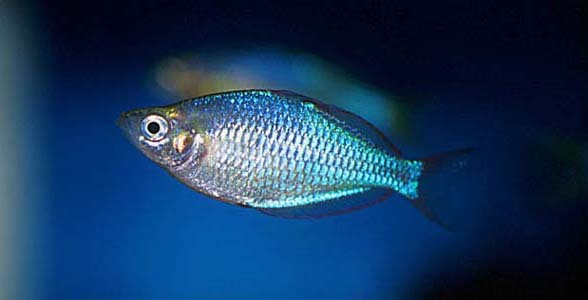 3.2″ (8cm), although usually smaller in aquaria. An active species, so despite its small size it requires an aquarium measuring at least 24″ x 12″ x 12″ (60cm x 30cm x 30cm) – 55 litres. 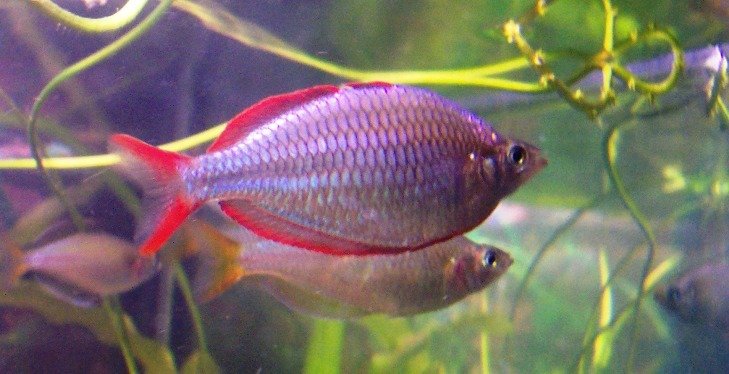 This little rainbowfish is ideally suited to a heavily planted setup and will show its best colours in such surroundings. It doesn’t appreciate bright conditions and we suggest the use of floating plants to diffuse the light entering the tank. Allow open spaces between areas of planting to allow swimming space and areas for males to display at one another. High water quality is essential to the well-being of this species, so weekly partial water changes are recommended. Like most of its congeners, it’s an unfussy, omnivorous species and will accept most dried, frozen and live foods. Regular feedings of the latter will help to ensure the fish exhibit their best colours. Very peaceful and suitable for many community aquaria given its relatively small size. Good tankmates include other similarly-sized rainbowfish, characins, danios, barbs, dwarf cichlids, freshwater gobies, and catfish such as Corydoras. 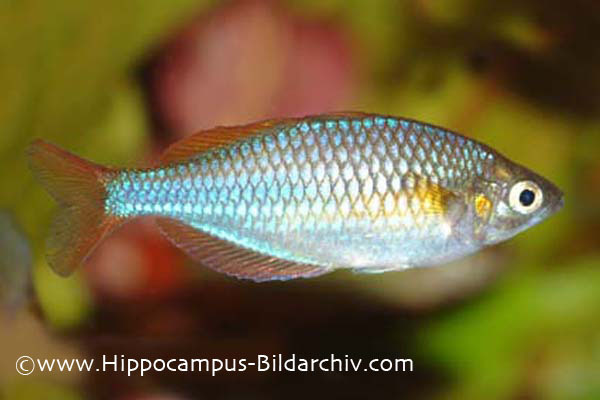 Like other rainbowfish it can be quite skittish and does far better when kept in a shoal of at least 6-8, preferably more. The males will also be encouraged to display their best colours in the company of conspecifics. Mature males are larger and exhibit brighter colouration than females. They also develop a much deeper body than females as they grow. As with other members of the genus, this is not a difficult species to breed, being an egg scatterer. The fry can prove somewhat tricky to raise in the early stages. The breeding aquarium should be at least 18″ long, and contain slightly hard, alkaline water with a pH of around 7.0 and a temperature of 75-80°F. A small air-powered filter will provide sufficient oxygenation and flow. The tank should be filled with fine-leaved plants, such as java moss, or nylon spawning mops. No substrate is necessary. The adult fish are best conditioned as a group in a separate aquarium with plenty of live and frozen foods. As the fish come into condition, the females will appear noticeably plumper, and males will display to each other almost constantly. Select the fattest, best-coloured pair for breeding and introduce them to the spawning tank. A small raise in temperature can often induce spawning. The pair will spawn for a period of several weeks, laying batches of eggs each day. These are attached to surfaces by a small thread. The adults tend to eat the spawn, and it’s easier to raise the fry in a separate aquarium, so we recommend checking the plants or mops regularly and removing any eggs you find to a raising tank containing water from the spawning tank. The eggs hatch in 7-10 days, depending on temperature. The minute fry initially require infusoria–type food, before graduating onto free swimming foods, such as brine shrimp nauplii, after a week or so. Sinking foods are unsuitable as the fry tend to stay very close to the water surface. Brood size is usually a little larger than with other rainbowfish. Reproduction and Notes duplicate text. “The fry can prove somewhat tricky to raise in the early stages. ” — untrue, one can easily achieve nearly 100% survival. Do mention that the fry requires fine powder food initially (better than infusoria) and maintaining stable temperature is essential. Fry growth is faster than average rainbow sp.